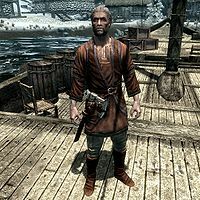 Guthrum is an aging Nord ranger who resides in Dawnstar aboard the permanently docked ship, The Sea Squall. Like the other crewmembers on the Sea Squall, Guthrum spends all of his time on deck, wandering, sweeping, eating or drinking. He never sleeps but may sit down on one of the available chairs and relax. He wields an iron war axe and wears a regular set of merchant clothing and a pair of boots. He carries a random selection of common items and gold. Even if the Sea Squall is not going anywhere, he seems quite happy with his life, saying, "I plan to spend all the days I got left on the water. It's where I belong. ", "Once sailing gets in your blood, it don't get out." and "I been a sailor for so long, I could navigate these rivers an' seas blindfolded." He will also comment on the inexperienced captain of the ship: "Cap'n Wayfinder's as green as seaweed, but he's learnin'." This page was last modified on 15 October 2014, at 08:51.